Taraji P. Henson has kept busy during her nearly two decades of acting — including an Oscar nomination for her role in THE CURIOUS CASE OF BENJAMIN BUTTON — but she admitted to me she’s still a little shocked by the sheer amount fan love she’s received from her time playing Joss Carter on CBS’ PERSON OF INTEREST. And while Henson knew Carter’s tragic demise was coming, what she didn’t realize was how much her exit would rock fans. Henson intended to stick to films post-PERSON OF INTEREST (her latest movie, NO GOOD DEED, is out today), but when she got the script for the upcoming Fox musical drama, EMPIRE, she quickly changed her mind. As Henson looks ahead at her future in television, she’s excited at the prospect of sinking her teeth into Cookie’s life. Cookie also has some fabulous style — “I love it!” Henson enthused — which will serve to add additional insight into the character. A vicious one, if Henson has her way: when I asked her what she most hoped to get to do in season 1 of EMPIRE, her answer was instantaneous. 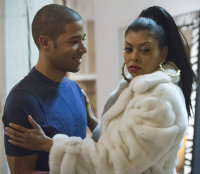 EMPIRE will debut on Fox in 2015. Taraji, you are awesome and your fans think more of you than you can ever know. The fact that NO GOOD DEED is #1 at the box office this weekend probably indicates a lot about how strongly you are admired and respected, as well as supported. Empire is going to be fabulous and highly anticipated. Be ready for everyone wearing “animal prints” in your honor. Thanks for being talented, strong, brave and undaunted. These traits make you a role model. Let’s leave Person of Interest in your rear view mirror. That thing is tired old news, except for Jim kissing you and loving you. That was delicious! whoah this blog is excellent i really like reading your posts. Keep up the good paintings! You already know, a lot of people are searching around for this info, you can aid them greatly. I genuinely enjoy your web site, but Iâ€™m having a dilemma: any time I load 1 of your post in Firefox, the center with the web page is screwed up – which is bizarre. May possibly I send you a screenshot? In any event, maintain up the superior function; I undoubtedly like reading you. Then after a genuinely long time, a decade possibly, you can become a captain. Following study just a couple of with the weblog posts in your web site now, and I actually like your indicates of blogging. I bookmarked it to my bookmark site listing and will probably be checking once again soon. Pls take a look at my internet page as properly and let me know what you think. Keep up the fantastic piece of function, I read few posts on this internet website and I believe that your web blog is truly intriguing and contains lots of superb data. Hi there, this weekend is fastidious in support of me, since this point in time i am reading this impressive educational article here at my residence.